I've had generally pretty good luck with Apple laptop batteries. The Nickel Metal Hydride (NiMH) battery in my PowerBook 5300 lasted through the machine's useful life span (six years, counting the three years my daughter used it in high school and college) and will still hold a bit of a charge after 12 years. The original battery in my late 2002 G3 iBook, now handed off to my wife, still takes a charge, although runtime is now reduced, and it will need replacement soon. The original battery in my 17" PowerBook G4 (manufactured in 2004) is also getting a bit long in the tooth, but still working reasonably well. However, the OEM battery that came in my Pismo PowerBook, like the rest of the machine, was a year old when I got it and had evidently been cycled a lot (although the computer itself was in virtually flawless, virtually as-new condition) and was offering only about one-and-a-half hours of runtime by age two years, failing suddenly and completely at the three-year mark. The palm rest over the battery compartment became extraordinarily warm to touch, and then the battery went stone cold dead. By contrast, the original battery in my WallStreet PowerBook lasted nearly eight years. I replaced the original Pismo battery with a used Apple-branded Pismo battery, reasoning that at the time I didn't use the 'Book with battery power much, but it was a false economy. I paid 80 bucks, and the used unit lasted four months. Having learned my lesson the hard way, I resolved to get a good battery, and bought a Newer Technology NuPower 6600 mAh unit from Other World Computing. This has proved an excellent battery over the past two-and-a-half years, providing substantially longer runtime on battery power than the OEM units did at their best. 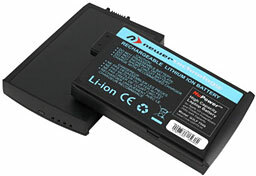 NuPower batteries are available for all models of G3 and G4 PowerBooks and iBooks (save for the original PowerBook G3 3500 Kanga of 1997/8) offering from 16% to 62% greater capacity than the OEM batteries depending on the model of computer. The 62% improvement is for the PowerBook Pismo, whose OEM 50 Watt, 4630 mAh battery was undeniably puny. The NuPower Pismo extended life battery is available in an 81 Watt-Hour, 7500 mAh version for $149.99 and a 68 Watt-Hour 6300 mAh version for $129.99. I went for the cheaper one, and it delivers more than four hours running time, so the 81 Watt-hour unit should give you close to five hours at least. When I bought a second Pismo 15 months ago, which became my "road" laptop, I ordered it without a battery and installed a FastMac TruePower extended life unit. While these batteries are a bit more expensive than standard capacity models, I'm convinced the extra cost is worth it, at least if you use your machine for road warrioring or live in a locale where power interruptions are a frequent occurrence as they are where I live. The latest FastMac TruePower 10.8V, 6600 mAh, 71 Watt-Hour Pismo batteries that are the focus of this review provide 43% more capacity than the original Apple battery. With two of these units fully charged in the Pismo's left and right bays, you're good to go for an entire eight-hour workday - and even beyond with a bit of battery conservation strategy employed. Last weekend, with a new example of these batteries installed, I cruised through a typical morning's work (2-1/2 hours) on the now upgraded to 550 MHz G4 Pismo using no power conservation measures, display backlight at normal brightness, dialing on and off the Internet via internal modem, and still had 50% battery capacity remaining at the end of the session. "With the Pismo's two battery bays and our G4 upgrade, you can literally go halfway around the world without a recharge," said Michael Lowdermilk, Business Development Manager for FastMac Performance Upgrades, Inc.
Incidentally, with its 5400 RPM Toshiba hard drive, my Pismo almost certainly places more demand on the battery than a stock 400 MHz or 500 MHz G3 Pismo with a 4200 RPM drive would. FastMac TruePower batteries are available for all G3 and G4 PowerBooks and iBooks (except for the original PowerBook G3 Kanga), as well as for both sizes of MacBook Pro and both colors of 13" MacBook. The a 71 Watt-Hour, 6600 mAh version for Pismo sells for $109.95 (a perviously available 7800 mAh, 84 Watt-Hour unit that sold for $149.95 has been discontinued). FastMac say their 550 MHz G4 processor upgrade for the Pismo actually helps extend battery runtime, combining a low voltage, low-power, and cooler-running G4 processor design that helps the high-capacity battery yield even longer battery run times. FastMac recommends that in order to get the best possible performance from the extended life battery, the internal control chip needs to be calibrated. This is easy to do. Proceed as follows. First, fully charge the battery after installation. Once it's up to full capacity, unplug the AC power adapter and continue to use the computer normally until the charge is completely drained. [Editor's note: If you're using the Classic Mac OS, you can use Battery Amnesia to run down the battery for you.] If you're used to the somewhat diminished charge life of an elderly OEM battery, it will probably take a surprisingly long time to discharge the new unit. When the battery charge is completely drained, plug the power adapter back in and recharge. FastMac suggests that to reach full runtime potential, it may be necessary to run two or three battery calibration cycles, and that for peak battery life, the unit should be recalibrated every month or so. A note on plugging in power adapters. On older 'Books, Apple used to recommend that you plug the adapter into wall current before connecting it to the computer, and vice versa when disconnecting. This sounds intuitively "wrong," but as I understand it, the initial jolt of power from plugging a connected power adapter into wall current could potentially damage the computer's power management circuits. I've read somewhere that this is no longer a problem with the more recent 'Books, but I still figure it's prudent to plug the adapter into the wall first. 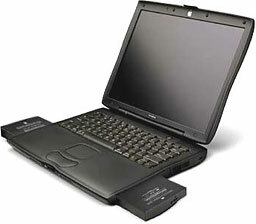 Another recommended measure for extending battery life is to keep the computer running as cool as possible, using a laptop stand, a cooling pad or some such. To maximize runtime under battery power, a few more points are worth noting. FastMac utilizes custom form factors and materials to achieve an excellent fit and finish, matching the original battery appearance, complete with four charge state indicator LEDs, whilst increasing capacity. Each battery is individually tested and includes safety features to protect against overcharge, overheating, short circuits, and power surges. TruePower is the name of a proprietary FastMac technology designed to extend the life of ordinary Lithium Ion cells, which are commonly used in rechargeable batteries. This patented technology allows tiny ceramic particles (each less than a millionth of a millimeter in size) to be integrated into the molecular structure of the chemical binding agent found inside each battery. According to FastMac, these particles then link in with each other and an energy management circuit to create an extremely dense and highly conductive layer on the surface of a capacitor-enhanced battery pack. This combination delivers the power necessary to satisfy the pulse demands placed on most batteries, whilst ensuring the protection of the lithium cell matrix. This results in battery packs that can be recharged many more times as well as yielding longer run times per charge. Whereas ordinary battery packs start losing their power within a few months, TruePower-enhanced battery packs are claimed to continue giving consistent power for long periods. TruePower batteries feature a patented material & energy management circuit designed to protect the battery's internal lithium crystal matrix from damage caused by power spikes. These spikes occur when the computer demands a sudden high current peak- for example, to turn on the backlight or restart a sleeping hard drive. Over time, these power spikes decrease capacity, runtime, and battery life, eventually rendering the power cells unusable. Through the use of TruePower technology, the energy management circuit is able to smooth out the power spikes and lower the rate of decay. This protects the battery and leads to a longer life cycle. Not only does this extend the usability of the computer, it also helps the environment by curbing the depletion of chemicals and plastic materials used in battery products and reducing the number of waste batteries sent to landfills. Sensors in the integrated circuit inside the battery detect undesirable levels of swelling or a short circuit that will power off the battery in certain extreme conditions. The first order of business when adding a replacement battery should be to to charge it and calibrate it. Both Newer Tech and FastMac recommend that you charge a new battery for at least 12 hours regardless of what percentage is showing. Once it's up to full capacity, calibrate it for peak performance by unplugging the AC power adapter and continuing to use the computer normally until the battery runs out of power, which automatically puts the computer to sleep. If you're used to the somewhat diminished charge life of an elderly OEM battery, it will probably take a surprisingly long time to discharge the new unit. When the battery charge is completely drained, plug the power adapter back in and recharge. FastMac suggests that to reach full runtime potential, it may be necessary to run two or three battery calibration cycles, and that for peak battery life, the unit should be recalibrated every month or so. The battery has an internal microprocessor that provides an estimate of the amount of energy in the battery as it charges and discharges, and it needs to be recalibrated from time to time to keep the onscreen battery time and percent display accurate. Apple has two pages with fully detailed instructions on battery calibration: Calibrating Your Computer's Battery for Best Performance and Calibrating an iBook or PowerBook Battery in OS X 10.4. In brief, after running the battery down, plug in the machine and let the battery charge to full capacity. At that point it is calibrated. While battery replacement from time to time is part of the cost of portable computer convenience and data security, as I noted at the top of this column, I've had pretty decent luck with Apple batteries over the years. I don't take any special longevity measures - I just keep my 'Books plugged in and sleeping when I don't have them on the road, and while that's not a recommendation or a prescription, it has worked well for me. 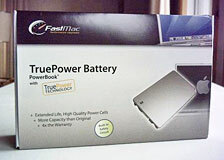 FastMac's TruePower extended life battery for the PowerBook Pismo (and Lombard) sells for $109.95. Each battery carries a 1 year warranty and a 30 day money back guarantee. 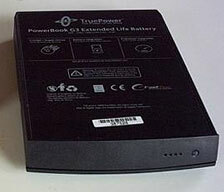 FastMac also sells TruePower batteries for the following Apple laptop models, most priced at $99.95, although not all models offer greater capacity than Apple's OEM units, some are claimed to offer up to 68% more. In summary, I'm very satisfied with the performance of these extended life batteries. You can find cheaper replacement batteries, but not all that much cheaper, and the extra capacity is the clincher. With two of the 6xxx mAh units, you should be able to go 8-10 hours or more unplugged from AC power, at least with a Pismo. Pretty cool. Low End Mac rating four out of four.